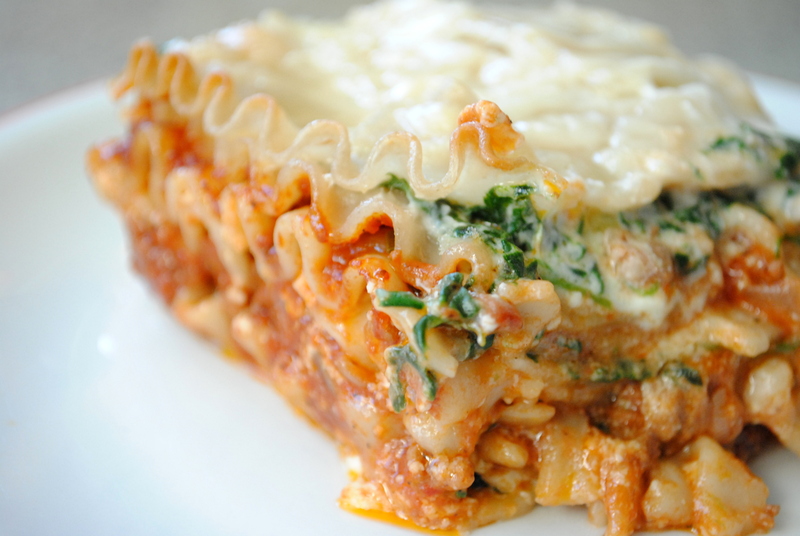 wicked good (gluten-free) lasagna | gluten-free glory! I made lasagna today, possibly for the first time ever, and definitely the first time ever gluten-free. It was delicious. Not perfect, but delicious. The recipe is an adaptation of a few Alice Waters recipes, and it definitely took me about 3.5 hours, 4 if you count the clean-up…but was worth the time and effort. Totally worth it. Here’s the recipe, with notes at the end about what I’ll do differently next time. Roast 1-2 red pepper(s) in the oven for 45 minutes at 425 degrees. Turn once or twice while roasting, then peel, seed, and dice. This will go into the meat sauce, later. Heat a medium-sized pot over medium heat. When hot, pour in 1-2 Tbsp olive oil. Sauté onion until translucent; add garlic and cook for 1-2 minutes. Add the meat; when brown, mix in the spices, cocoa powder, and brown sugar. Add tomato sauce (and red peppers if they’re done), then cover and simmer for 15-20 minutes. A few minutes before assembling the lasagna, stir in parsley. Melt butter in a small pot. Stir in tapioca starch; cook over medium heat for 3 minutes. Bit by bit, add half and half, whisking constantly. You’ll want to add small amounts at a time, so you can avoid lumps. Tapioca starch is much stickier than white flour, so the texture will be stringy at first. By the end, you should have a smooth sauce – but it does take some serious whisking! Once the milk is added, turn down the heat to the lowest setting and keep warm until you’re ready to assemble the lasagna. Be sure to stir every few minutes – this sauce burns REALLY easily! Cook spinach over 1 teaspoon olive oil in a skillet over medium heat. Season with salt (I used ~2 teaspoons); add garlic just before the spinach is almost wilted, then cook for another 1-2 minutes. Set aside to cool, then form into a ball and squeeze out extra water/moisture. Chop finely and mix in a bowl with ricotta, olive oil, and salt. Mix in Parmesan and nutmeg (and salt, if desired). Set aside until ready to assemble. Prepare lasagna according to package directions. I did two batches and found that it fell apart pretty quickly. I’d also set a timer on it next time, and slightly undercook it; it was a little overcooked this time, and therefore a little bland/watery tasting once it came out of the oven.